It was in the early 1990’s that I started my first activities as an artist promoter, inspired by a profound admiration for the Bulgarian pianist Marietta Petkova, who had just come to live in The Netherlands. At that time, being a musician myself, I did not know much about ‘managing’ yet. My only concern was to introduce this unique artist to the audiences. Today, Marietta Petkova is acknowledged as a true master pianist. Having become more experienced over the years, I decided to keep my eyes and ears open for other artists as well, provided that I would commit myself only to those who would really have stolen my heart. Good management is all about passion…! In this sense, the choice for Vesko Eschkenazy was an easy one. Who doesn’t love his warm and humanized playing? Moreover, apart from being a famous virtuoso, Vesko is one of the most sympathetic persons I know. The same counts for Dominic Seldis, who joined us in June 2013 (I cannot imagine a better ambassador for the double bass and classical music) and for Arno Bornkamp. Another interesting collaboration is the one with Maestro George Pehlivanian. And not to forget: the Aurelia Saxophone Quartet (until its final curtain in Spring 2017) and the RCO Chamber Soloists. An exciting special project in 2015/2016 has been ‘Chopin meets the Blues goes Big’ by pianist Peter Beets and the Northern European Jazz Orchestra: simply too hard to resist, with a tour of 20 concerts in The Netherlands as a result. A similar project is the Bernstein Celebration Tour: 11 concerts for the Millennium Jazz Orchestra with Claron McFadden and Laura Bohn. Through these cross over projects I learned a lot about fund raising and educational possibilities. It is a great honour for me to be the intermediary for these world class musicians. Whether you are a concert promoter, artistic director, member of the audience or just a music lover, I will be happy to supply you with all the information you need. 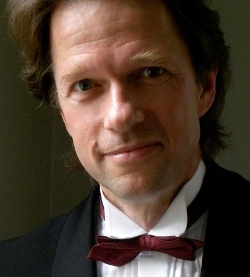 HAIKO BOONSTRA studied piano, violin and orchestral conducting at the Conservatorium van Amsterdam, graduating as a solo pianist in 1989 and as a conductor in 1998. His main teachers were Jan Wijn and Roland Kieft. In 1989/1990 he spent a year as Resident Artist at The Banff Centre for the Arts in Canada, completing the Advanced Studies In Music program. He followed piano masterclasses with Gary Graffman, Nelly Ben-Or, Anton Kuerti and many times with György Sebök in Amsterdam, Canada and Switzerland. His debut as a soloist with orchestra had been with the Frysk Orkest in Brahms’ First Piano Concerto. Haiko has given piano recitals and radio performances until 1994, when he shifted his focus towards teaching, conducting and artist management. As a conductor he took masterclasses from Peter Eötvös, David Porcelijn and Joop van Zon in Amsterdam and from Michael Kukushkin and Alexander Polishuk at the Peter the Great Music Academy in St. Petersburg, where he conducted the Orchestra of the State Hermitage and the St. Petersburg Camerata. Since then he has conducted several youth and semi-professional orchestras in The Netherlands, such as the JeugdOrkest Nederland, the Nederlands Jeugd Strijkorkest, the Amstel Strijkers Ensemble and the Orchester der Landesregierung Düsseldorf. He was principal conductor of Musica Instrumentalis Hilversum (1999-2010) and of the Ad Hoc Orkest Utrecht (1998-present). He collaborated with soloists such as Liza Ferschtman, Marietta Petkova, Thomas Oliemans, Gwyneth Wentink, Marieke Schneemann, Rosanne Philippens and Timothy Gill (solo cellist of the Royal Philharmonic Orchestra). In 1996 Haiko Boonstra became Personal Manager of pianist Marietta Petkova, which eventually led to the foundation of HB Personal Artist Management in 2001.